I added Identity Theft Monitoring to this alarm and alert site because of my past experience with Id Theft. Someone purchased a $50,000 SUV with my SS# and the next day purchased with my SS# again, $1,400 worth of flashy tires and rims. Had I had the monitoring service, they would not have gotten as far as they did. Thanks to our due diligence and the dedicated work of the local police the thief is serving 10 yrs. behind bars. The monitoring of your credit history is important, in order to detect any suspicious activity on your credit report. Companies offer such service on a subscription basis, typically granting you: regular access to your credit history, alerts of critical changes to your credit history. 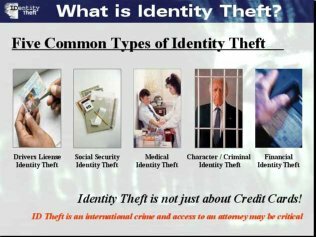 Id Theft Monitoring can help you detect credit related fraud and identity theft. One of the more popular firms is Freecreditreport.com, best known for its humorous commercials featuring a singer who, because of his failure to monitor his credit rating, finds himself in embarrassing situations (such as being forced to buy a used subcompact, the only car he could afford on his poor rating). Such services are typically available either as 3-Bureau service (with access to data to all 3 national credit reporting bureaus). It is often advisable to see data with all 3 bureaus (Equifax, Experian and TransUnion) to detect identity theft. Companies providing credit monitoring will typically alert you to important activity such as credit inquiries, public records, delinquencies, negative information, employment changes, new accounts and other changes to your credit history.